While reading East of Eden last month, my caption on an Instagram post was: "Sometimes a novel can explain the Bible better than a priest." And that was true. Seldom before this, have I ever been questioning why Cain was evil, while Abel was all good, in the Book of Genesis. If you have not been familiar with the story, East of Eden is following the lives of two families in Salinas Valley: the Trasks and the Hamiltons; though along the way I felt that the Trasks were the center of this book, while the Hamiltons only its satellite. It was within the Trask dynasty that Steinbeck imitated the Book of Genesis, by naming its member (and drawing their destinies) following the symbol of good versus evil: Cain and Abel (C & A). The first generation siblings were Charles and Adam. Like Cain, Charles envied his brother Adam because, loving his father so much as he was, the father preferred Adam's birthday gift than his. Ironically, Adam did not love his father, even almost hated him for forcing him to be a soldier; while Charles loved his father silently, and longed for his affection, but never got it. At one point Charles tried to kill Adam, but failed. And from then on he grew sour in life. Fast forward. Adam had two sons—twins—who he christened as Caleb and Aron (again, C & A). I don't have to mention which was the symbol of evil and which the good! The envious relationship between brothers was repeated here. Aron was a lovely child, and since birth has effortlessly won everyone's affection, including his father, which made him a spoiled child. While Caleb was a brooding and sinister child. But luckily, this new generation has had a loyal servant in their houshold; an intelligent Chinese man called Lee. It was Lee who first brought up the famous "Timshel" issue onto the surface. Timshel is a Hebrew word for "thou mayest" in Genesis 4:12: "When thou tillest the ground, it shall not henceforth yield unto thee her strength; a fugitive and a vagabond shalt thou be in the earth." (KJV) There were many discussions among Lee and several scholars concerning this particular verse. Different English translations had their own interpretations of this word. But the scholars offered different point of view. 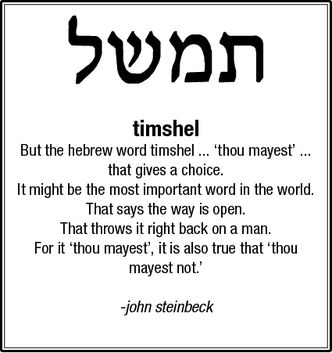 The more perfect translation should have been "thou mayest", which could be interpreted as choice, instead of order ("do thou" in other versons) or promise ("thou shalt" in King James Version). This threw a different perspective concerning the original sin we inherited from Adam and Eve. 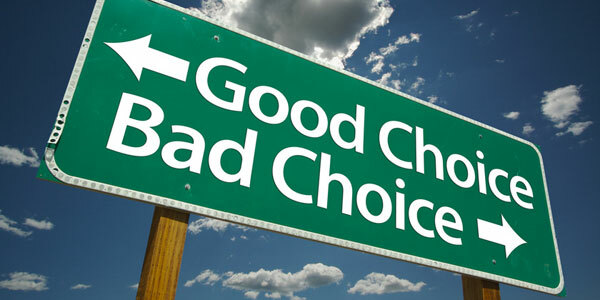 It meant that being good or evil was not rooted from our ancestors, but was all in our OWN choice. We may be good if we choose to. Back to the story, like Cain, Charles and Caleb were both tainted with the same evil mark. Unfortunately, Charles didn't have a "Lee", who in Caleb's case has totally changed him and, I believe, many lives around him, by giving Caleb a second chance to be better. The ‘e-book-or-print-book’ must have been one perpetual debate in bibliophile’s world. Many of my friends give firm answer whenever this question arises: print book. But more and more, I think, they also pick e-book from time to time. Several years ago I bought a Kindle. 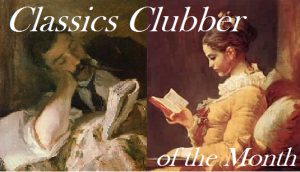 And being a classics-lover, naturally I loaded my Kindle with free e-books of many classics—that’s one advantage of reading classics, you can LEGALLY get free copies. But soon enough I grew weary of my old Kindle; what with the re-starts it required every now and then, and with the fast-exhausting power, that I finally left it for good. Left without e-reader, my love for print book returns; and once again I become one of the fervent advocates of “print book is always the best”. 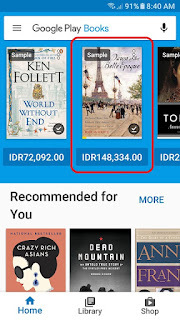 Last month, on the occasion of Chinese New Year, Google Play Books generously granted 90% discount for its e-books. 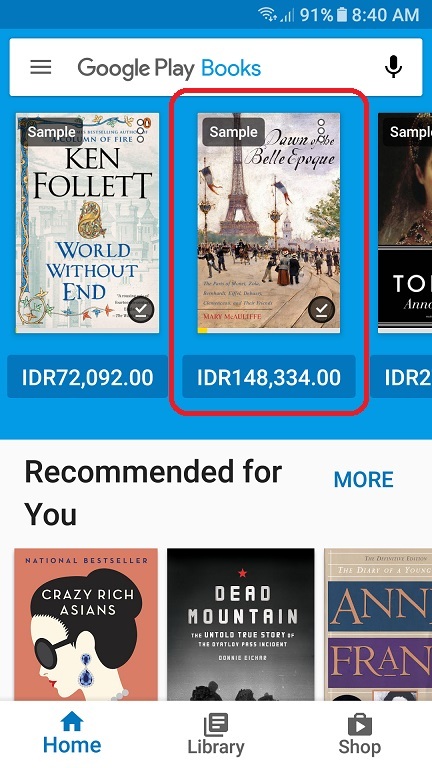 Of course I rushed to Play Books to see whether some books which have long been in my wishlist are available—and of course to compare the prices. You see, I have not opened my Play Books app for quite a long time, so I’m impressed that now they make the pages color dimmer than I used to know. I ended bought three e-books, and almost instantly started to read one of them. I confess now that I was thoroughly enjoying every bit of the reading. Not only the book itself, but the experience of reading from my smartphone! I always hate doing errands which require queuing or waiting. If I can anticipate it, I always bring a book. But sometimes it’s unpredictable, and this is where e-books saved into your smartphone would be very useful! 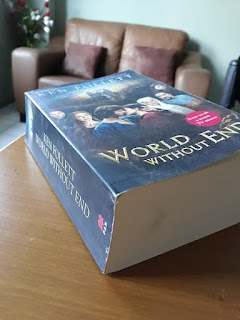 World Without End-print book, monstrous eh? 2. More efficient in keeping (a whole library in my palm ^^). I don’t have to kick out my favorite collection every now and then just to make place for new comers. 3. Much cheaper (especially for classics—but of course the collectible ones do not included here, ha!). 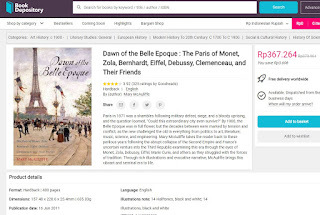 The same book at Book Depository-priced twice! 4. Adjustable font size (I hate small fonts with little space!). I work full day, and mostly in front of the computer. I don’t want to restrain my eyes, but at the same time I don’t want to sacrifice either my job or my hobby to one another. For several years now my mom is suffering from eyes disorders which cause her sight to gradually declining. From this I learned how valuable my sight is, and I have to take good care of it from now on. 5. Flexible reading in every condition of light (thanks to modern smartphone’s adaptable lights! ), meaning that I don’t have to restrain my eyes on cloudy days when I cannot put off my book. 6. This is my favorite: Play Books provides SAMPLES! 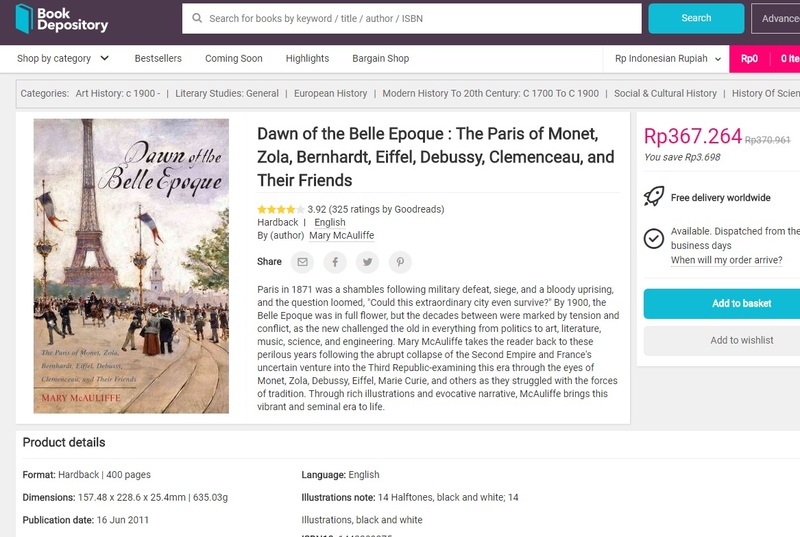 Especially for books which I am curious of, but still not certain, I can always download the sample and read/browse a bit before deciding to buy it. Eureka! Considering all that, I will have two growing library, physical and digital. Does it mean I will stop reading print books? Of course not! There are books that I absolutely need to read the printed copy. But it’s also relieving to have a second alternative which enables me to read more books. 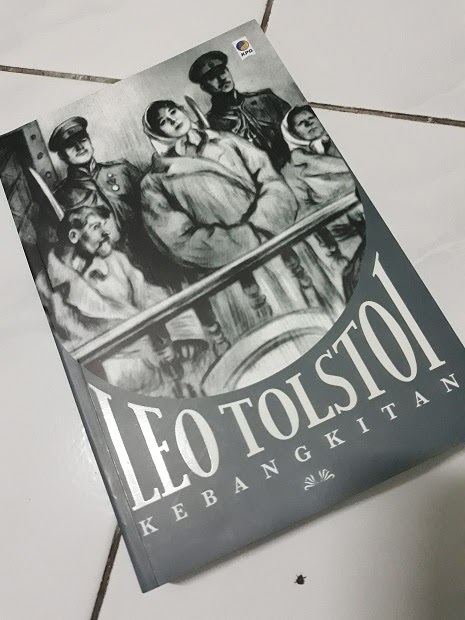 After the real tough War and Peace years ago, I have sought opportunity to read (and love) more of Leo Tolstoy’s. However, I ended despising Resurrection, Tolstoy final work. The protagonist is a nobleman, Prince Nekhlyudov. He has wronged a peasant girl, Maslova (Katushya), and got her pregnant. Ten years later Nekhlyudov is selected to be a juror in a murder case. To his surprise, the accused is Maslova, the girl he has wronged long ago. The sweet-innocent girl has fallen into prostitution; and it’s all because of him. When Maslova is sentenced to prison in Siberia, Nekhlyudov is determined to redeem his sin by following her, and even marrying her. In the process, Nekhlyudov becomes familiar with prison lives, and he witnesses many injustices commit by powerful people whom he befriended in his life pre-Maslova case. So, the process of helping Maslova also changes Nekhlyudov’s, mentally and morally. The main critic of this book is the injustice and hypocrisy of man-made laws. Many of the prisoners in the state prison where Nekhlyudov often visits are innocent and mistreated. The authorized legal persons and the riches do not care about the prisoners. Nekhlyudov keeps wondering, how those people can be so blind to not seeing the blunder, and why this injustice keeps happening. And more importantly, what must be done to stop it. The story itself is hard to believe and artificial. From the beginning of his involvement with Maslova’s cause, Nekhlyudov has been searching for the bottom of the whole problem. He understood more than before, but was still puzzled. 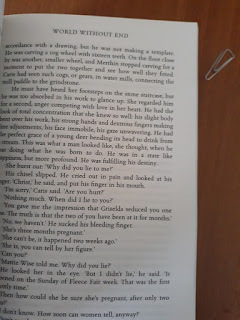 In the last chapter, someone has given him a pocket Bible, which he absent-mindedly put into his pocket. Later when he was in his room, and was racking his brain for THE answer, he accidentally found the pocket bible in his pocket. Then he remembered of the sayings that the Bible has the answer to every question… something like that. And so he opened it casually, and just read the chapter printed there, which was, coincidentally, Matthew 18 (and Tolstoy really put all the verses into the book.) 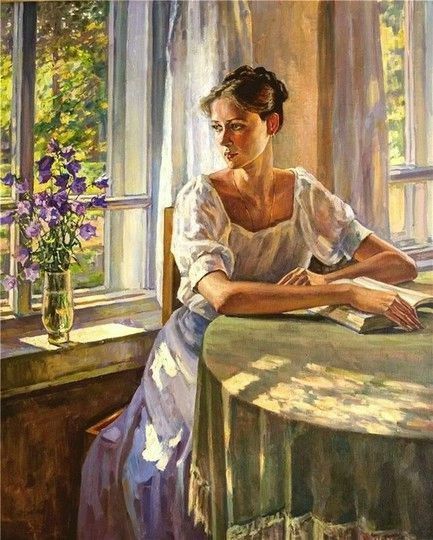 And after Nekhlyudov read them all…. Bam! His mind opened, and suddenly he knew all the answers! So sorry, comrade! This is just not my cup of tea. 2,5 / 5 is the final verdict. And for the time being, no more Tolstoy for me, thank you. 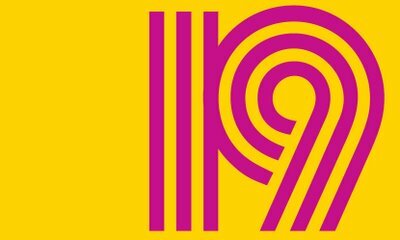 I have read 4 of 12 books for #TBR2018RBR . My favorite so far is March. Little Women is never my favorite, so at first I doubted whether I’d like March. But as usual, I was wrong; it’s much better than Little Women! Right now I am tackling a non challenge book: Anna and the King of Siam (I need to purge my brain after the tedious Resurrection! And I have found this e-book on a Play Books promo last month. 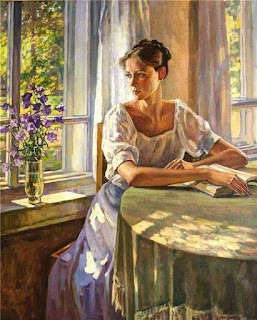 So for the next several days I will read from my phone.) There is also Thornton Wilder’s The Ides of March which I planned to read during Easter holiday. I have been a bookworm since before I could even read. My mother used to read for me from illustrated children stories. So, my earliest knowledge about good and evil came from tales such as Hansel and Gretel or Cinderella, where the villains were always totally evil and the main protagonists purely innocence. That formula then shaped my perspective about the world through my childhood. When I was about 10 or 11 years old and already been bored with my children books, my father—from whom I inherited the love of books—suggested that I tried Agatha Christie for a change. I picked After the Funeral from school library, and was instantly falling in love with Christie's. 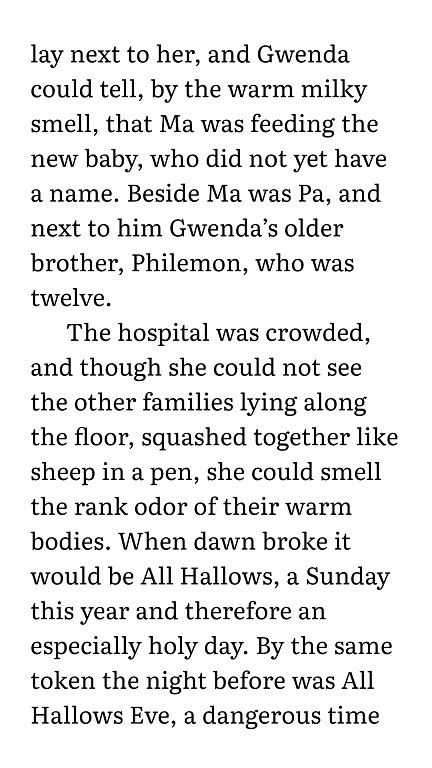 I don't remember the exact title, but one of the books has really shattered my conviction about good and evil. The pattern repeated while I ploughed through nearly all Christie’s book. Christie's murderers were mostly ordinary, good, respectable persons who, when being under certain pressure, decide to commit murder. From Christie I learned that a murderer does not have different qualification from normal persons—which until then I was certain I never possess. This suggested that every human being has the possibility to commit murder. It only needs a decision. It really made me shuddered when I came to this conclusion. I imagined that with only a weapon (and it could be just a pair of scissors or a penknife) I could have killed someone if I decided to. I, too, could have been a murderer. And like all teenagers, there was really a phase when I hated many things in the world; which only added to my fear of myself! Like Christie said, murder is simple. And that thought has literally ended my childhood innocence. Fast forward; like everybody else, I read Harry Potter series. On the last chapter of Harry Potter and the Deathly Hallows, Harry's youngest son Albus Severus has been worried that he might be sorted to Slytherin on his first departure to Hogwarts; to which Harry calmed him: "Albus Severus Potter, you were named after two headmasters of Hogwarts. One of them was a Slytherin and he was the bravest man I've ever known. […] If it really means that much to you, you can choose Gryffindor. The Sorting Hat takes your choice into account." 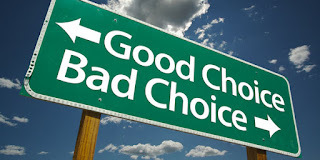 It implies that being good or evil is our own choice; the decision is in our hand; others will only “take our choice into account”. 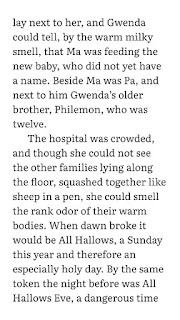 Really, if I have not, at that time, been impressed by J.K. Rowling's power of storytelling, that passage only would have made me love Harry Potter. Of course, ever since the Agatha Christie period, I have learned much about freewill and "God created everything good" doctrines; but that passage has strengthened my believe, that to be good or evil is our own choices—the freewill God has imposed upon us, which no one—not even Himself—can take from us. For quite a long time afterwards, I held on to that conviction. Then I got to know one 19th century French writer who then became my most favorite author: Émile Zola. 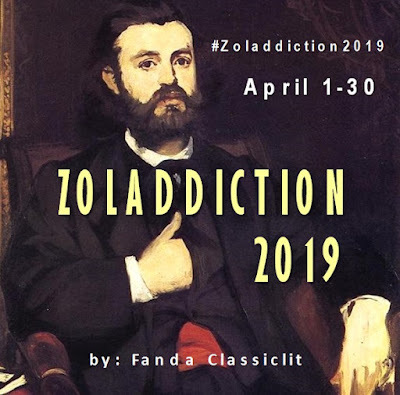 As much as I admire and respect his works on the heredity and environment effect on shaping human psychology, I can’t help thinking that Zola’s characters seem always to be imprisoned by this handicap (heredity illness). And while I always love his beautiful prose and mind-blowing stories—and I do admire his genius study on this subject—I also keep asking myself: “But what about freewill?” Maybe that’s why Zola has never been as much respected as his piers—because he praised the nature of man more than his divine quality. 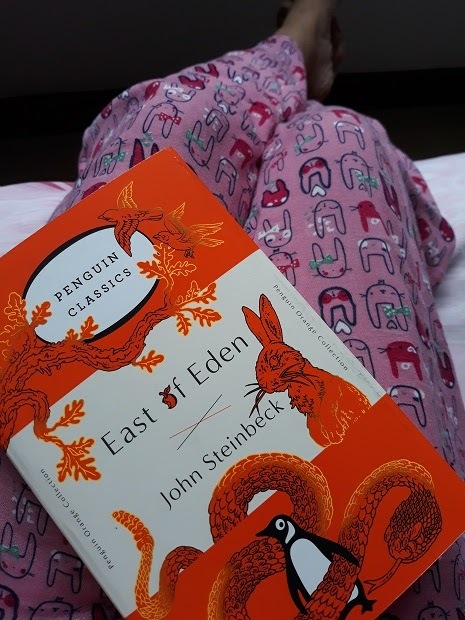 Fast forward again… Many classic pieces that I have devoured these years talked about conscience and freewill (William Golding’s Lord of the Flies is one of them), but they did not struck me as heavy as John Steinbeck’s magnum opus that I have just read: East of Eden. It’s as if John Steinbeck, through this magnificent book—and its prominent keyword: timshel—is re-convincing me about the goodness of man. That no matter how bad, how evil, how monstrous were our ancestors, and how thick their blood is inside our veins, it is what we choose that in the end matters, because God has imposed us with the most precious gift: the freedom of choice.